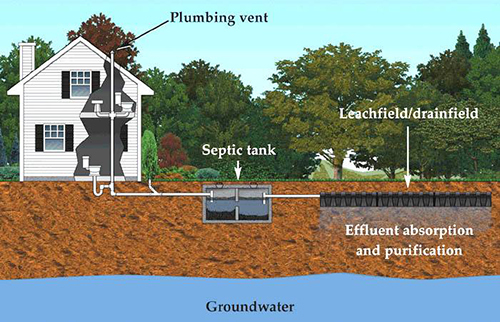 A septic system receives, treats and disposes of unwanted wastewater and solids from a building’s plumbing system. Solids are partially broken down into sludge within a septic tank and are separated from effluent (water) and scum (fat, oil and grease). Effluent regularly exits the tank into a drain field where it is naturally filtered by bacteria and reentered into the groundwater. Scum and sludge must be pumped periodically and should never enter the drain field. The Septic tank should be pumped every 4-5 years. Find the date that the tank was last pumped. Ultimately, sludge level should determine whether a tank should be pumped, but knowledge of previous pumping dates can be a helpful reference. Ensure that the system is large enough for the home that it serves. A four-bedroom home, for instance, typically requires a 1,200-gallon tank. The more occupants living in the home, the larger the tank that is required. Capacity in gallons can be calculated by tank dimensions. For rectangular tanks, length x width x depth in feet x 7.5 = capacity in gallons. For round tanks, 3.14 x radius squared x depth in feet x 7.5 = capacity in gallons. Check for liquid waste that has made its way to the ground surface. This condition is unsanitary and indicates that the system is overloaded. Make sure that the tank is watertight so that wastewater does not contaminate groundwater, and groundwater does not flow into the tank and cause it to overfill. If riser lids are present, they should be inspected for cracks and made sure they are secure. Make sure that the baffles are firmly connected to the tank’s inlet and outlet pipes. Drain lines should each receive the same amount of wastewater. They can be examined by opening the distribution box. If the box becomes tipped or clogged, it will disproportionately allocate effluent, and potentially flood sections of the drain field. In summary, septic system inspections should be performed on an annual basis to ensure proper function. The septic tank is the most expensive household fixture and its lifespan will be shortened significantly if it is not maintained.